Only a Rocking Unicorn could be more magical than a rocking horse. This plush unicorn toy is soft, cuddly and ever so lovable. Little ones can even press the ears to hear their unicorn neigh and gallop. This beautifully designed rocking toy makes a magical addition to any playroom or child’s bedroom. 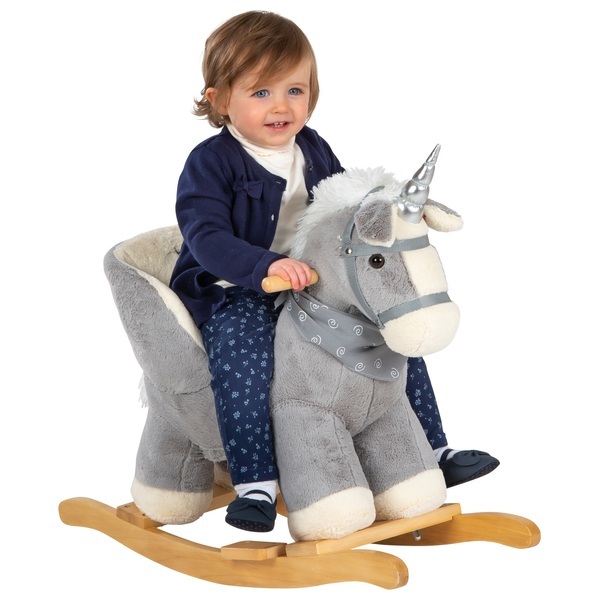 The curved rocking frame and handles are made from handcrafted hardwood for a classic finish, while the shining horn and halter details are sure to capture your little one’s imagination. The Rocking Unicorn gives kids the support they need to rock safely—and it’s super fun. The high seat back curves around to keep your little one supported on all sides. Comfortable padding and cosy plush fabric make this one fantastic unicorn. The strength and durability of the frame ensure the Rocking Unicorn will last for years to come, making it a wonderful toy for any family. EU Warning: This toy is not suitable for children under 18 months due to small parts which may cause a choking hazard or risk of falling.